It’s been 50 years since President John F. Kennedy spoke of ending world hunger, yet on the eve of World Food Day, Oct. 16, the situation remains dire. The question “How will we feed the world?” implies that we have no choice but to intensify industrial agriculture, with more high-tech seeds, chemicals and collateral damage. Yet there are other, better options. Something approaching a billion people are hungry, a number that’s been fairly stable for more than 50 years, although it has declined as a percentage of the total population. “Feeding the world” might as well be a marketing slogan for Big Ag, a euphemism for “Let’s ramp up sales,” as if producing more cars would guarantee that everyone had one. But if it worked that way, surely the rate of hunger in the United States would not be the highest percentage of any developed nation, a rate closer to that of Indonesia than of Britain. The world has long produced enough calories, around 2,700 per day per human, more than enough to meet the United Nations projection of a population of nine billion in 2050, up from the current seven billion. There are hungry people not because food is lacking, but because not all of those calories go to feed humans (a third go to feed animals, nearly 5 percent are used to produce biofuels, and as much as a third is wasted, all along the food chain). The current system is neither environmentally nor economically sustainable, dependent as it is on fossil fuels and routinely resulting in environmental damage. It’s geared to letting the half of the planet with money eat well while everyone else scrambles to eat as cheaply as possible. While a billion people are hungry, about three billion people are not eating well, according to the United Nations Food and Agriculture Organization, if you count obese and overweight people alongside those with micronutrient deficiencies. Paradoxically, as increasing numbers of people can afford to eat well, food for the poor will become scarcer, because demand for animal products will surge, and they require more resources like grain to produce. A global population growth of less than 30 percent is projected to double the demand for animal products. But there is not the land, water or fertilizer — let alone the health care funding — for the world to consume Western levels of meat. Let’s at last recognize that there are two food systems, one industrial and one of small landholders, or peasants if you prefer. The peasant system is not only here for good, it’s arguably more efficient than the industrial model. According to the ETC Group, a research and advocacy organization based in Ottawa, the industrial food chain uses 70 percent of agricultural resources to provide 30 percent of the world’s food, whereas what ETC calls “the peasant food web” produces the remaining 70 percent using only 30 percent of the resources. Yes, it is true that high-yielding varieties of any major commercial monoculture crop will produce more per acre than peasant-bred varieties of the same crop. But by diversifying crops, mixing plants and animals, planting trees — which provide not only fruit but shelter for birds, shade, fertility through nutrient recycling, and more — small landholders can produce more food (and more kinds of food) with fewer resources and lower transportation costs (which means a lower carbon footprint), while providing greater food security, maintaining greater biodiversity, and even better withstanding the effects of climate change. (Not only that: their techniques have been demonstrated to be effective on larger-scale farms, even in the Corn Belt of the United States.) And all of this without the level of subsidies and other support that industrial agriculture has received in the last half-century, and despite the efforts of Big Ag to become even more dominant. In fact if you define “productivity” not as pounds per acre but as the number of people fed per that same area, you find that the United States ranks behind both China and India (and indeed the world average), and roughly the same as Bangladesh, because so much of what we grow goes to animals and biofuels. (Regardless of how food is produced, delivered and consumed, waste remains at about one third.) Thus, as the ETC’s research director, Kathy Jo Wetter, says, “It would be lunacy to hold that the current production paradigm based on multinational agribusiness is the only credible starting point for achieving food security.” This is especially true given all of its downsides. The result is forced flight to cities, where peasants become poorly paid laborers, enter the cash market for (increasingly mass produced) food, and eat worse. (They’re no longer “peasants,” at this point, but more akin to the working poor of the United States, who also often cannot afford to eat well, though not to the point of starvation.) It’s a formula for making not only hunger but obesity: remove the ability to produce food, then remove the ability to pay for food, or replace it with only one choice: bad food. It’s not news that the poor need money and justice. If there’s a bright side here, it’s that the changes required to “fix” the problems created by “industrial agriculture” are perhaps more tractable than those created by inequality. We might begin by ditching the narrow focus on yields (as Jonathan Foley, director of the Institute on the Environment at the University of Minnesota, says, “It’s not ‘grow baby grow’ ”), which seem to be ebbing naturally as land quality deteriorates and chemicals become less effective (despite high-tech “advances” like genetically engineered crops). Better, it would seem, would be to ask not how much food is produced, but how it’s produced, for whom, at what price, cost and benefit. Instead, the money and energy (of all kinds) focused on boosting supply cannot be overstated. 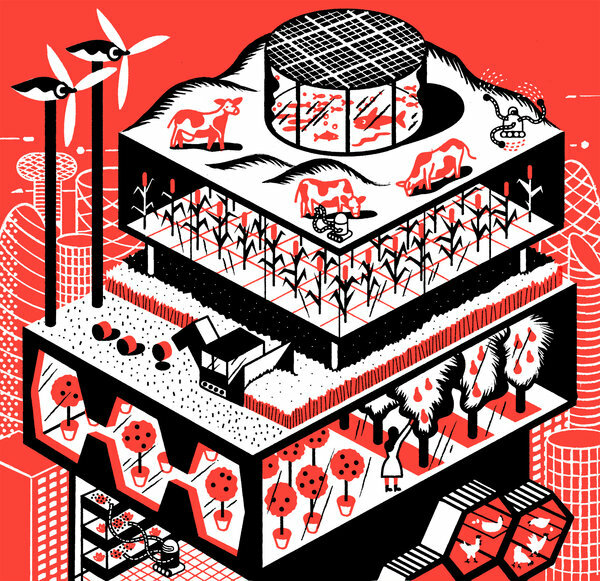 If equal resources were put into reducing waste — which aside from its obvious merits would vastly prevent the corresponding greenhouse gas emissions — questioning the value of animal products, reducing overconsumption (where “waste” becomes “waist”), actively promoting saner, less energy-consuming alternatives, and granting that peasants have the right to farm their traditional landholdings, we could not only ensure that people could feed themselves but also reduce agriculture’s contribution to greenhouse gases, chronic disease and energy depletion. That may sound new age-y, but so be it; all kinds of questions and all kinds of theories are needed if we’re going to produce food sustainably. Supporting, or at least not obstructing, peasant farming is one key factor, but the other is reining in Western-style monoculture and the standard American diet it creates. Some experts are at least marginally optimistic about the second half of this: “The trick is to find the sweet spot,” says Mr. Foley of the University of Minnesota, “between better nutrition and eating too much meat and junk. The optimistic view is to hope that the conversation about what’s wrong with our diet may deflect some of this. Eating more meat is voluntary, and how the Chinese middle class winds up eating will determine a great deal.” Of course, at the moment, that middle class shows every indication that it’s moving in the wrong direction; China is the world’s leading consumer of meat, a trend that isn’t slowing. But if the standard American diet represents the low point of eating, a question is whether the developing world, as it hurtles toward that nutritional nadir — the polar opposite of hunger, but almost as deadly — can see its destructive nature and pull out of the dive before its diet crashes. Because “solving” hunger by driving people into cities to take low-paying jobs so they can buy burgers and fries is hardly a desirable outcome. Mark Bittman is a food journalist, author and contributing opinion writer for The New York Times.